My Bilingual Talking Dictionary - Gujarati & English is a unique resource which introduces over 650 widely used words, arranged thematically and with colourful illustrations. Each illustration is labelled with its name in English, Gujarati (script) and Gujarati (transliteration using roman alphabet). It can be used alone as a traditional picture dictionary but it also has a very special added extra - if you own a PENpal Talking Pen, then you can download the audio for FREE and your picture dictionary then becomes a talking book. Touch each word to hear a native speaker repeat the word to you, in either Gujarati or English, so that you can perfect your pronunciation & intonation. 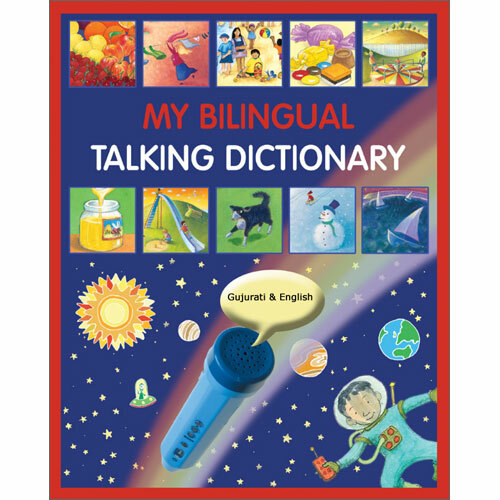 My Bilingual Talking Dictionary - Gujarati & English is a high-quality book that can either be used as a fun picture dictionary in its own right, or can be matched with a PENpal Talking Pen (available separately) to make a complete learning package. Aimed at Gujarati-speaking children learning English as a foreign language, it would also be suitable for English-speakers who are learning Gujarati as a foreign language. Aimed at ages 4 - 8 (Early Years, Key Stage One and Key Stage Two).